Early on in this "adaptation" of the late-80s cop show 21 Jump Street, the Metropolitan City police chief makes sure to mention the inherent hackery of "reviving" old ideas. 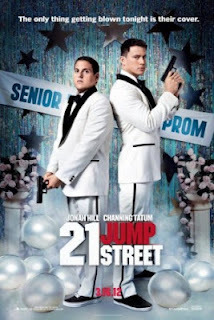 This sort of meta-"wink, wink" -- both the name of the city and the tacit admission of guilt by the filmmakers (Lord and Miller, of Cloudy with a Chance of Meatballs fame) -- is exactly what sets this version of 21 Jump Street apart from most hackneyed adaptations... and indeed most mainstream comedies of today. I certainly wouldn't have thought it going in, but 21 Jump Street is a whip-smart laugh-fest that isn't afraid to kick you in the balls, even as it winks knowingly. It doesn't take 21 Jump Street long to start turning expectations on their head (all the better to to do the presumed beer bong). After the obligatory chunk of backstory and the training montage, the nerdy Schmidt (Hill) and ex-jock Jenko (Tatum), through a series of moronic events, wind up at 21 Jump Street, the headquarters for the whole "cops undercover in high school" unit that is the crux of the TV show and the reason for this adaptation. A (telegraphed) mix-up in the principal's office leads to their identities being switched. Suddenly, it is Schmidt who has to fit in with the popular kids, while Jenko is relegated to nerd duty. Only it turns out that both of them are more suited to the task than they'd have thought -- which is where the movie really gets interesting. Nowadays, to Jenko's chagrin, the popular kids are multiracial (and sexual), tolerant, vegan, drama kids. In short: nerds. Gone are the traditional letterman jacket-adorned beefcake bullies. Schmidt, who wound up on the wrong end of that equation too many times in high school (usually, it is intimated, at the hands of Jenko), is overjoyed at the chance to be popular, while Jenko, now the outcast, is forced to bond with the science nerds (who are still outcasts here -- some things never change). This puts the now-buddy-buddy Schmidt and Jenko's partnership to the test as they try to get to the bottom (well, top) of a high school drug ring. But before you can really say, "Hey, that's clever!" the movie begins an almost wearying (in a good way) assault of gross-out and physical comedy. With talent like Hill, Riggle, and bit player Chris Parnell, it is only to be expected. The movie's first (of many) truly gut-busting moments is when the duo are forced to try the new designer drug they are supposed to be investigating. The resulting trip takes them on a (magical mystery) tour of all the school cliques -- drama, band, track, science, etc., with the filmmakers mining as much humor out of the identity switch as they can. All the high school movie clichés are utilized as the movie progresses -- boy meets girl, a house party (another highlight), and, of course, prom -- but the distance provided by the main conceit allows for a fresh perspective, saving the film from the sand trap of worn out tropes. The movie also riffs on the buddy cop genre -- jokes abound about car chases, explosions, and shootouts, while Ice Cube is a walking, yelling, self-aware stock character as the duo's angry black Captain (it's also great to see him out of the dreaded Murphy Territory). Viewers with a keen eye will also be rewarded with a variety of gags about the generic-ness of the setting (see the Metropolitan City mention above), as well as a number of references to the original series (aside from the one obvious one). All in all, this is a much more intelligent adaptation than the franchise probably deserves -- Hill (who co-wrote the story), Bacall, Lord, and Miller clearly put a lot of care into this. What could have been a one-note parody or dumb action-comedy is instead a slick, clever, self-aware nugget of pop culture gold. It leaves me wishing more filmmakers would give this sort of treatment to the rip-offs and hack-jobs Hollywood seems intent on shoving down our throats. Fortunately (although it is probably just a final poke at movie tropes), a sequel is hinted at just before the credits. If it's real, I'd be the first one in line for 21 Jump Street: The College Years.